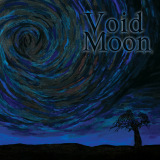 Void Moon, a relative newcomer to the Swedish doom scene, is a quartet consisting of Jonas Gustavsson (vocals/guitars), Peter Svensson (bass), Thomas Hedlund (drums), and Erika Wallberg (guitars). On the Blackest of Nights, their first full-length album, is a collection of their previous demos combined with some new material. The result is a solid album of traditional doom with a few glitches that, while it probably will never be seen as a classic of doom, is a decent listen for a few spins. Hammer of Eden starts out crisply, with a plodding, mid-tempo riff on the verse, but quickly slows down. The slowdown is slightly unpleasant to hear-- it almost seems like the doomy chorus was tacked onto a traditional heavy metal song, since its melody has very little in common with the verse, and it makes Gustavsson sound like he's singing off-key as soon as he hits the chorus. It's kind of a weird choice for an initial song. On the Blackest of Nights, however, puts the listener back into traditional doom territory, and partway through the song one sees a theme that repeats through the next few songs -- a light/dark section of clean guitar on that switches to doom metal and back. The riffs have some power but aren't crushing, and there's a strong feeling that the band is attempting to add a varied approach to their songs. Their epic/traditional sound is slightly marred by the songwriting (The Word and the Abyss strays dangerously close to boring territory, and a few times the drums felt out of sync with the guitar/bass), but though I wasn't as impressed with it on the first listen, after a few repeats I warmed to their style a bit more. I'll point to another thing that some might consider a nitpick. The two instrumentals don't get in the way, but there doesn't seem to be any point to their existence. They last two minutes and sound just like the softer moments of some of the full songs, so why are they around? I suspect the band thought it would be a good idea to put these in as lead-ins to their subsequent songs for atmospheric effect, but they don't seem to do much for the record. Other doom metal bands have used mini-instrumentals to grand effect, but these blend in too well with the full-length songs that they are sandwiched between to matter. The latter half of the album gets better and the music finally gets a bit more muscular. Cyclops is a turning point and more interesting, and both of the last two songs seem to be much better put together -- Through the Gateway, especially, is tightly arranged, melodic, and well-written, with the guitars/bass complementing Gustavsson's gritty voice beautifully. The final track, Mourning Son, again plays well with Void Moon's sound, dragging out the chorus and featuring a looming bass presence, supporting the guitars, that I wish I'd seen more of in the rest of their album. All in all, for a first effort, Void Moon hasn't done anything groundbreaking, but it's reasonably enjoyable, and a few of the songs promise better things to come. This is fair, but if they can improve their songwriting, they might produce something great.